The new tall screen aspect ratio is the first bridge between the Galaxy A and S lineups. For better or worse this screen ratio has become the hottest trend of 2017 and it's not going away. Naturally, Samsung has to cater to the users' demands and the S8's 18.5:9 Infinity AMOLED is now premiering on the Galaxy A8 (2018). The resolution has been lowered to fit the A-series profile - there are 1,080 by 2,220 pixels on the A8's screen making for a flagship-grade 441ppi density. The image is sharp, there is no visible pixelization whatsoever, and the Diamond PenTile pattern of the matrix is invisible to the naked eye. We expected the Galaxy A8 to post similar numbers in the tests as the most recent Samsung we've tested - the J7 Pro, and indeed it did. Maximum brightness in manual mode is reasonable at 390nits. In Auto mode, just like the J7 Pro, the A8 gets a healthy boost up to 590nits. Just like any recent Samsung AMOLED, the one on the A8 scored an excellent mark in our sunlight legibility test. This makes the A8 (2018) one of those phones to bring at the beach, especially now that there is ingress protection. Finally, there is one more display test to be aced. Samsung has been a master in color accuracy for quite some time, offering three different and very accurate color profiles (avg deltaE < 2, max deltaE < 4) - sRGB (AMOLED Basic), Adobe RGB (AMOLED Photo), DCI-P3 (AMOLED Cinema). There is also the default Adaptive mode, which has the widest color gamut, and it is calibrated for popping (vivid) colors (avg deltaE of 6.1). So, the Galaxy A8 (2018) not only comes with an immersive and high-res AMOLED screen, but its panel is nothing short of class-leading. There's a 3,000mAh battery inside the Galaxy A8 (2018), which should be enough for some good power autonomy enhanced by the efficient AMOLED and the 14nm chipset. There is fast charging supported which should fill about 40% of a depleted battery in half an hour. In our testing, the Galaxy A8 (2018) clocked in 17 hours looping videos and around eleven and a half hours when browsing the web over Wi-Fi. In voice calls, it is close to a full day. Frugal standby consumption helped achieve an overall Endurance rating of 92 hours. The Always-On Display was turned off by default and we kept it this way for our standby test. Keeping it on will noticeably diminish the endurance rating. 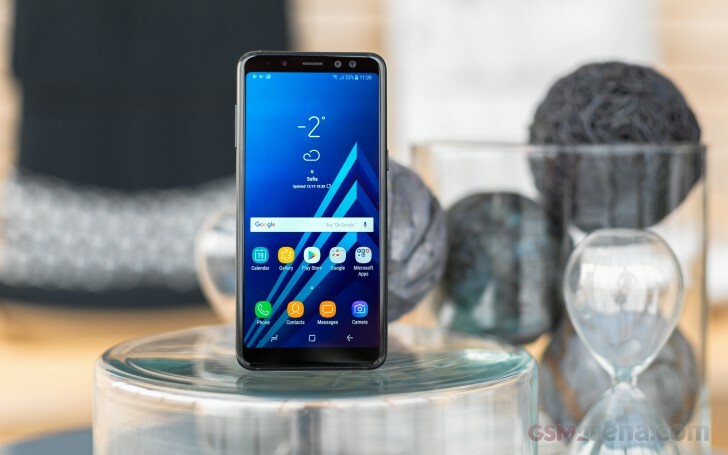 Our endurance rating denotes how long a single battery charge will last you if you use the Samsung Galaxy A8 (2018) for an hour each of telephony, web browsing, and video playback daily. We've established this usage pattern so our battery results are comparable across devices in the most common day-to-day tasks. The battery testing procedure is described in detail in case you're interested in the nitty-gritties. You can also check out our complete battery test table, where you can see how all of the smartphones we've tested will compare under your own typical use. The Samsung Galaxy A8 (2018) performed nicely in the first part of our audio quality test. When working with an active external amplifier it produced perfectly clean output and matched that with nicely high volume. Headphones introduced very little stereo crosstalk so the Galaxy A8 (2018) is much better in that aspect than most of the phones out there. They did bring some intermodulation distortion (which you don't hear easily anyway) and dropped the loudness to just above average, but the rest of the output was unaffected. Overall this is some of the cleanest headphones output we’ve seen on any phone lately. The Galaxy A8 (2018) has a single speaker at its disposal. It is positioned on the right frame above the power button, which, while a little unorthodox, should protect it from accidental muffling in most situations. It is also quite loud, scored a "Very Good" mark in our test, and subjectively - it has a rich and deep sound output.